One of England’s greatest Victorian architectural practices was based, not in London, but in the relatively quiet town of Lancaster. 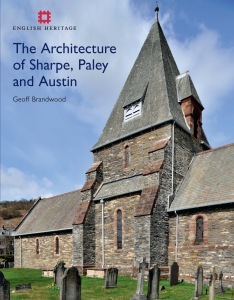 For just over a century the leading practice in the area was that of Sharpe, Paley and Austin. It was founded, just at the start of the Victorian Gothic Revival, by the remarkable, multi-talented Edmund Sharpe – architect, engineer, businessman, politician and winner of the Royal Institute of British Architect’s Royal Gold Medal for his work in architectural history. E G Paley developed the practice and took on in 1867 the man who elevated it to greatness – Hubert Austin, described as an architect of genius by Pevsner. The firm established a national reputation, especially for its many fine churches, ranging from great urban masterpieces to delightful country ones, which are imbued with the spirit of the Arts & Crafts movement. The practice was extraordinarily prolific and took on commissions for almost every imaginable building type – country houses, railways, schools, factories, an asylum and commercial premises in addition to the churches. The book explores with the aid of Austin’s great-grandson, not only the firm’s buildings but also a fascinating web of family and professional interconnections which provide the backdrop to the story. It is richly illustrated, including family photographs never previously published. This treatment will appeal to architectural historians, students of the architecture of the Victorian and Edwardian eras and social historians. This is the first serious account of one of the greatest of all Northern architectural practices.